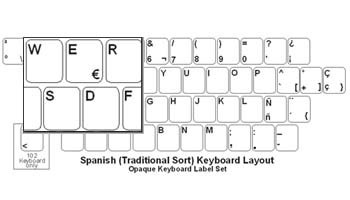 Spanish (Traditional Sort) keyboard labels convert any keyboard to a Spanish (Traditional Sort) keyboard. These labels are opaque and will cover the original legends on your keyboard. The Spanish (Traditional Sort) labeluses the Spanish keyboard layout (as used in Spain) in Windows. The labels areprinted on high-quality, durable Lexan® for years of use. Thislabel supports keyboard layouts for Spanish (Traditional Sort), Spanish(International Sort), Basque, Catalan, and Galician. This language is supportedin Windows Vista, XP, ME, 98, and 95; if a version of Windows does not have aSpanish language, the user can select the Spanish (Traditional) keyboard layout. Spanish labels are a very economicaloption for creating a Spanish keyboard. The language labels use an easypeel-and-stick method to install. They will not damage the original keyboard key. The letters are printed on the underside ofthe Spanish labels so that the lettering will not wear out. This affords youwith many years of durable use.